You don’t have to be a child to enjoy tricycles. 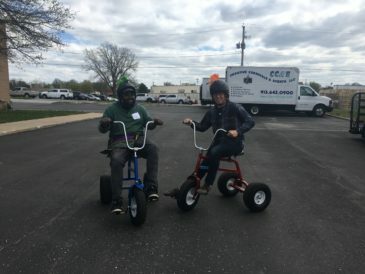 Your group will have a blast racing our Adult-Sized Giant Trikes! 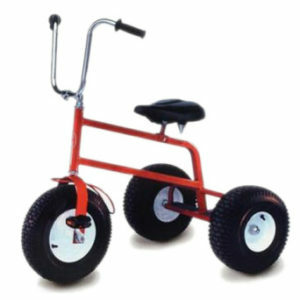 The trikes come with a set of cones, or you can upgrade to have it with our Free Wheelin Course or our Extreme Race Track. Arrange cones as desired for racing 2 trikes. Prepare Start/Finish line using tape, chairs, etc. I just wanted to send my compliments to you and everyone who helped make our little birthday party come together. Everything was absolutely perfect. The bounce house fit perfectly and was great looking, all of the entertainment were amazing. The kids loved all the games. The set up guys were so kind and professional. Thank you again for making the day PERFECT. I will use you again for sure. Everything was fabulous as always with your company…just love your team you have working with you…from the drivers who called when they were on the way, to the sweet young man who set up the redemption center…you and your team always go way above and beyond! It couldn’t have gone better. The kids absolutely loved the Dodge Ball Arena and we had great fun watching parent and child compete in the Challenge Jousting. What a great time our carnival was last night…what a great job the 2 guys who delivered and picked up did. They were courteous, helpful and extremely polite…I’m going to suggest for years to come that the PTA not use anyone but you guys…I’m a complete supporter now! Our night was beautiful! !…your games and inflatables made the night a huge success…your guys that delivered were wonderful…we look forward to next year! My church has used Creative Carnivals for the past 4+ years. I always enjoy working with Creative Carnivals because we KNOW they're reliable and have great products and excellent service! Our event was a huge success! The kids had lots of fun with the bounce house and EVERYONE loved the snow cones! Thanks again for helping to make our event awesome! Thanks for being so easy to work with…I was thinking of how many years I had used your company and I know it has been over 10…I tell everyone I can about Creative Carnivals & Events and how reliable and reasonable you are. Everything went great. Your drivers were tremendous and even when I had a last minute request to move an inflatable a few feet as they were leaving, there were absolutely no complaints. Two very respectful young men. Customer service is EVERYTHING to me and you and your staff nailed it! Everything worked out well…on-time delivery, easy setup/take down and pleasant associates made working with CC&E a pleasure. That was one of the best carnivals we have ever had!…want to give a hand to the guys that brought everything down-they were two of the most polite men I have ever met…you will hear from us again and we will spread the word that you are by FAR the best! !